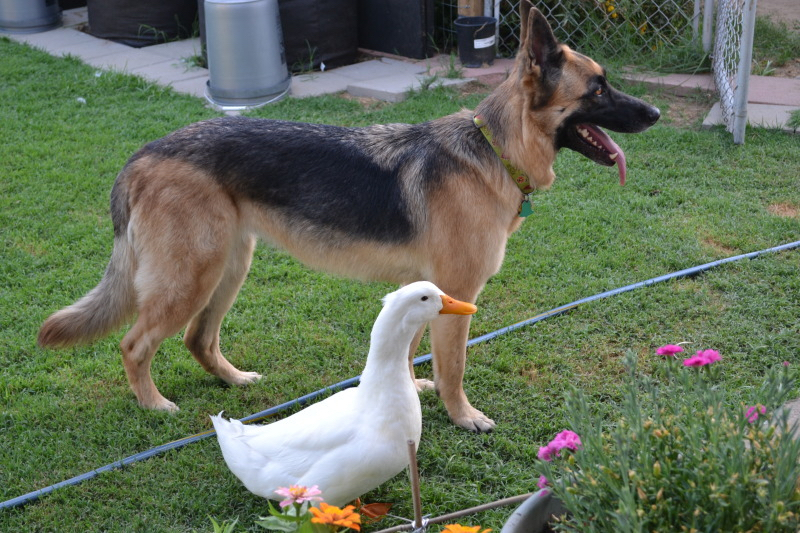 We’ve all seen the super cute photos: the chimpanzee snuggling with a baby tiger; the mother cat who’s accepted an abandoned infant pig as part of her litter; the German Shepherd who follows on the webbed heels of a duck with unflinching loyalty, and the list goes on. Each time, these scenes make a special deposit in our love bank because it’s unexpected and because it shows a soft side that we can’t explain, and sometimes can’t understand. The most shocking, of course, are the surprising bonds between predator and prey. A wildlife photographer was taking photos in northern Canada when a polar bear arrived on the scene. 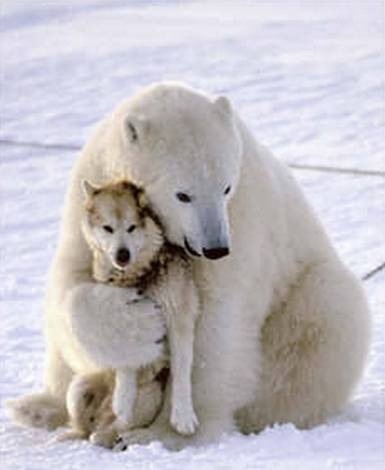 The photographer immediately feared for his Canadian Eskimo sled dog, but to his astonishment, the bear nuzzled the dog and in return, the dog licked the bear’s face. Thus a heartwarming round of playtime and cuddling began between two natural predators. How does this happen? Of course we all know it’s not a good idea for humans to take in a predator to try to tame it as a pet, but there are those instances where the lion is reunited with the conservation expert that saved his life and greets him with an embrace, and it warms us because there is no fear on either end. 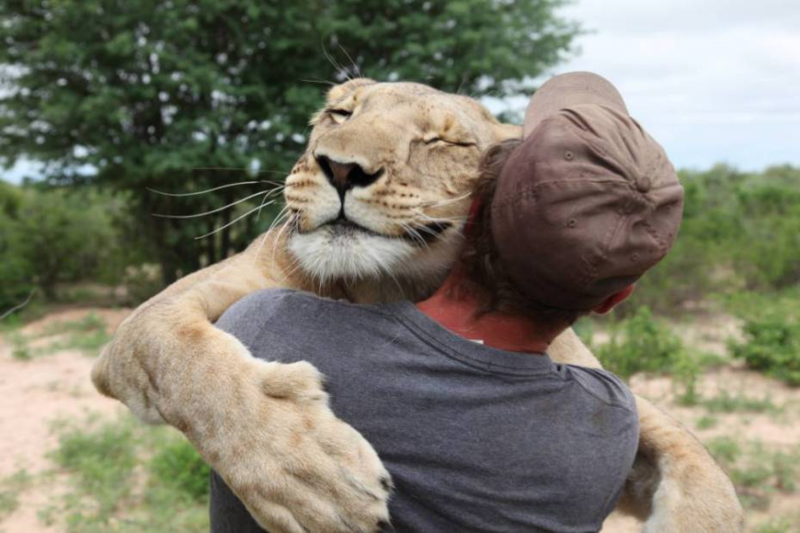 There is a bond, and the king of beasts has a memory of a time when it was vulnerable and this furless two-legged being came to its rescue. I think it’s a kind of love we all want to possess. We see these animals not only getting along and playing together, but embracing each other and holding each other in a way that shows ultimate safety and lack of discrimination. It’s hard for us to imagine embracing someone we don’t know and showing that kind of compassion, so we try to learn a lesson from these other species that it can be done. It’s especially hard when we see people that are different from us as potential predators. How do we make it our default reaction to embrace and accept and protect? That’s a question that I don’t have an answer for , but these animals definitely demonstrate that you can’t judge a book by even its furry cover. DCT’s holiday production NOT A CREATURE WAS STIRRING shows another unusual friendship between one of the most notorious of animal adversaries, the cat and the mouse. We see the Mouse family embarking on a dangerous journey to securely bypass the family cat to obtain some holiday decorations. I don’t want to spoil the ending, but I promise you that this play with give your family all the warm feels that you experience when you see the bird wrapping its wing around a cold baby bunny. It’s perfect for a holiday snuggle. 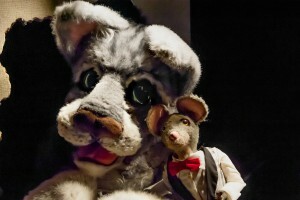 NOT A CREATURE WAS STIRRING with Kathy Burks’ cuddly puppets runs through December 23 in the Studio Theater. For tickets or more information, call 214-740-0051 or visit dct.org.